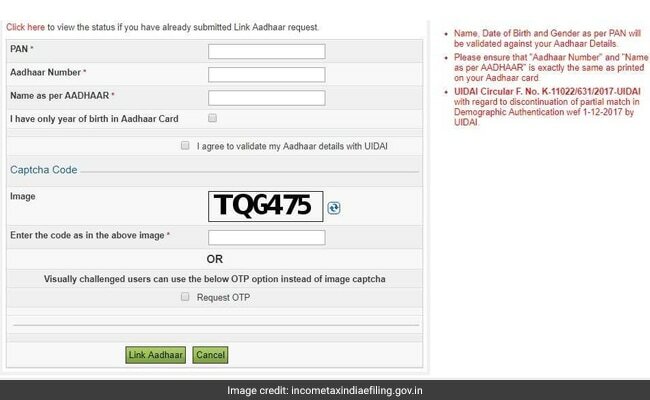 An Aadhaar card number can be linked with a PAN card number online through the Income Tax Department’s e-filing portal (incometaxindiaefiling.gov.in), according to the taxman. In order to do this, the user is required to click on the “link Aadhaar” option on the portal’s homepage to proceed. A request to link Aadhaar number with PAN can also be registered in the application to obtain a PAN card or apply for any changes in one’s information on the PAN card, according to the taxman.